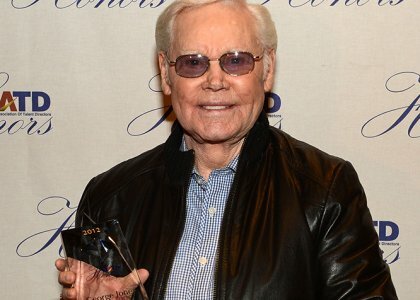 Country music legend George Jones died on Friday morning (April 26) at the age of 81. The beloved singer was hospitalized for a fever and irregular blood pressure earlier this week at the Vanderbilt University Medical Center in Nashville, according to his publicist Kirt Webster.Jones had number one songs in five decades from the 1950s to the 1990s and was recognized as a musical great by his colleagues including Frank Sinatra, Pete Townshend and Elvis Costello. “If we all could sound like we wanted to, we'd all sound like George Jones," Waylon Jennings once sang. One of George’s most famous hits was “He Stopped Loving Her Today,” which follows the story of a man who is madly in love with a woman until his death. He won a Grammy for the hit in 1981 and a second award for his song “Choices” in 1999.